Finally temperatures are cooling here. Saturday was in lower 30’s which is a big relief after the month of mid 40’s in May. June and early monsoon showers are very welcome. To make most of the lovely weather, we made an impromptu trip to Blackbuck resort in Bidar. 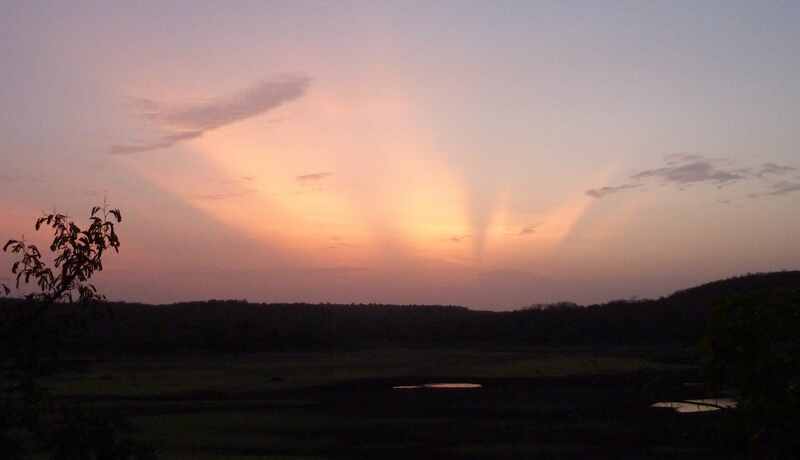 Technically in Karnataka, Bidar is a 3 hour drive from Hyderabad and a popular weekend destination from Hyderabad. 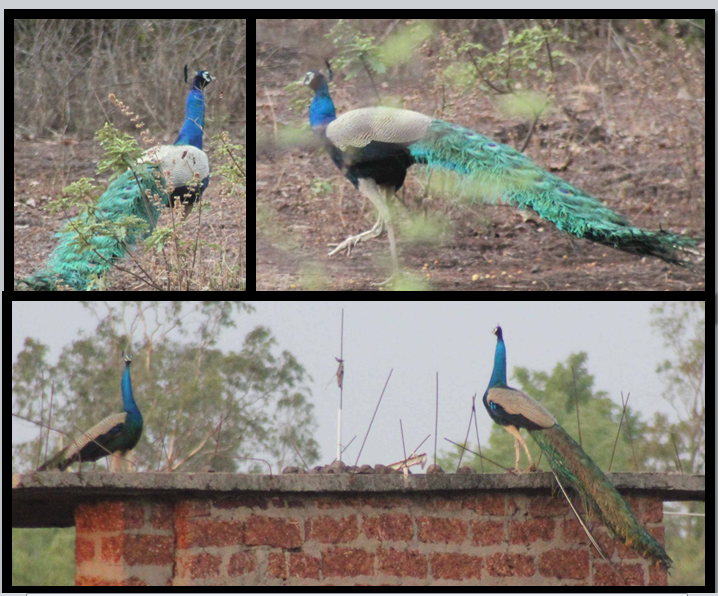 The resort is set on banks of Vilaspur lake about 25 kms from Bidar. 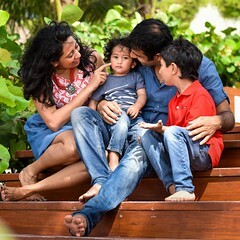 Most people start early on Saturday morning, have breakfast en-route and spend the morning exploring Bidar fort and tombs before heading to Blackbuck resort for lunch.Rest of the day can be spent at the resort with variety of activities. Nested on banks of lake, the blackbuck resort is home to langoors and peacocks. It is clean, spacious and offers package deals including meals at a reasonable rate. 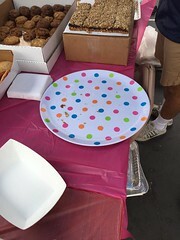 The staff is very helpful. While the resort is not very luxurious, it is a great place to unwind after a hectic week. 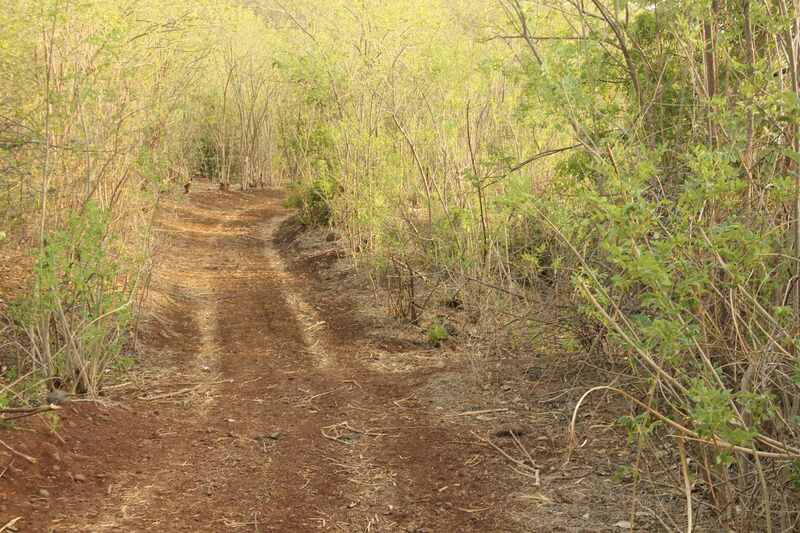 A lovely place amidst nature a short drive from hustle and bustle of Hyderabad! To keep visitors engaged, the resort offers a lot of activities. 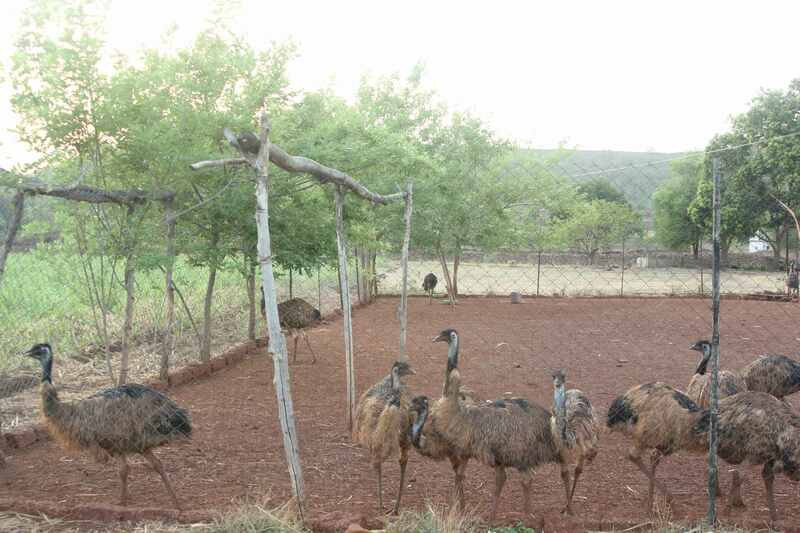 Nature walk to see Emu farm is offered in the evening. 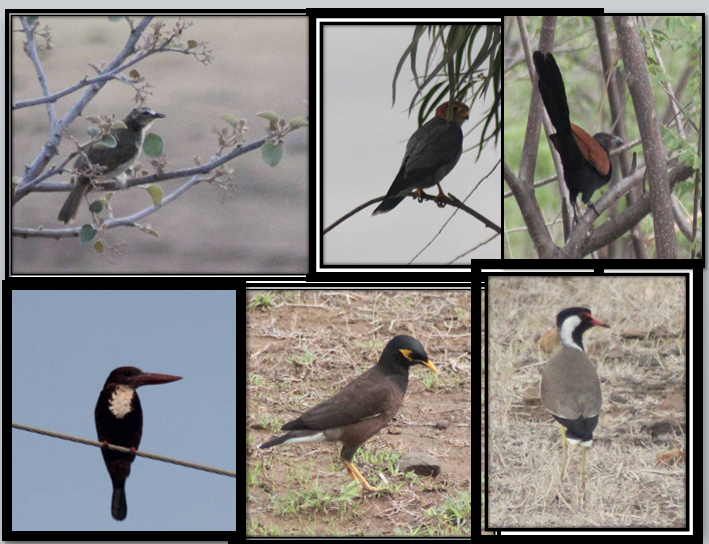 Lots of different varieties of birds are seen en-route and come visit the lake at sunset. 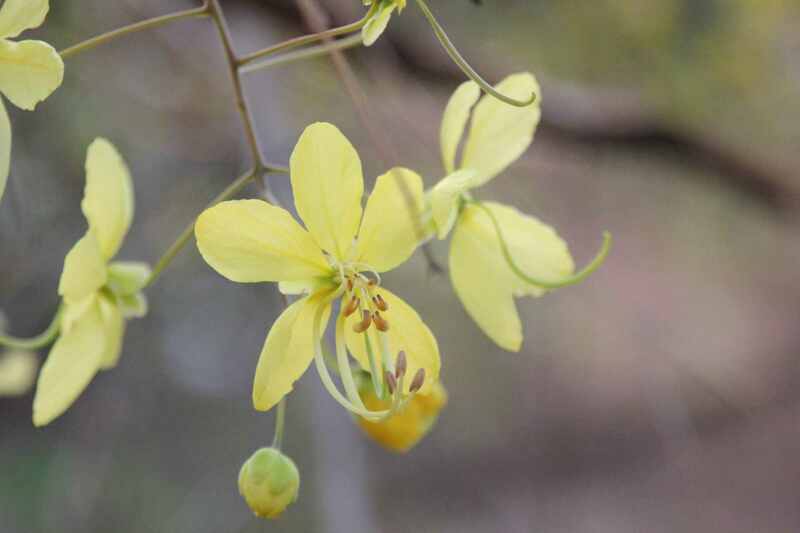 There were these yellow flowers in bloom all along the path along with fiery red Gulmohar. 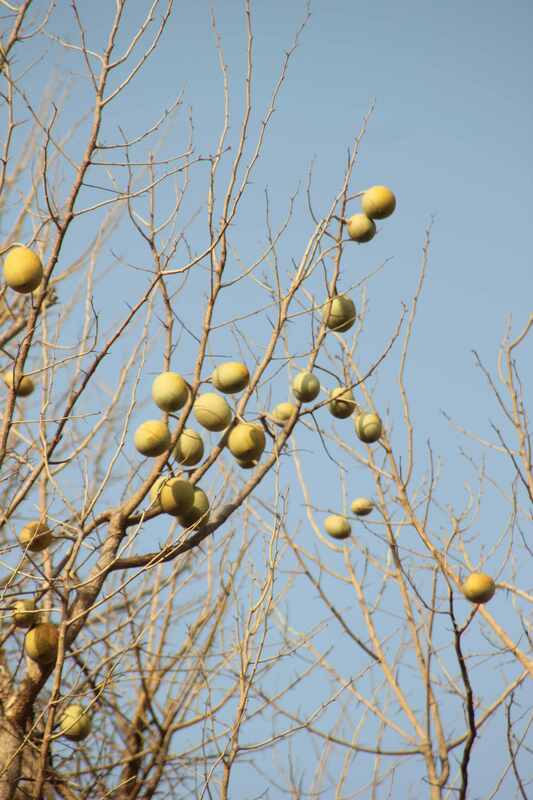 And so were these unique fruits that the birds love to feast on. When the lake is full post monsoon season the resort also offers coracle rides on the lake. The sunset over the lake was brought to life by the chirping of birds, playfulness of monkeys and the beautiful red-yellow afterglow. After sunset we enjoyed a wild life documentary along with a round of beer and snacks. Telescope was setup to star gaze and post dinner a campfire was setup. 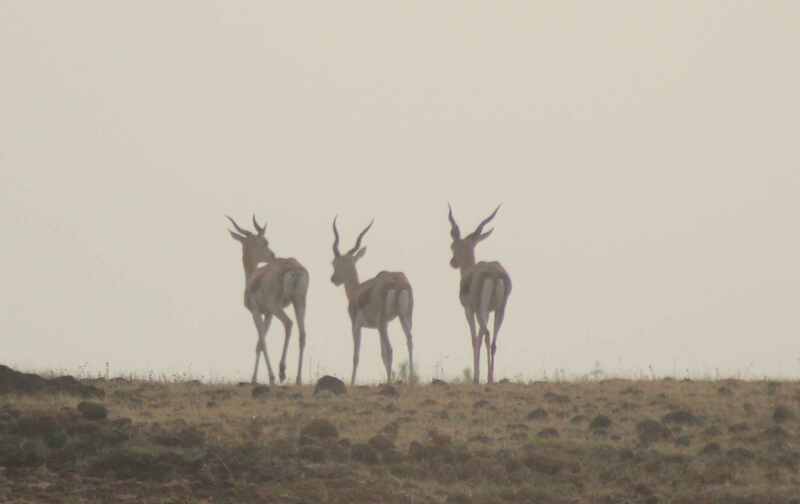 The best part of staying at the resort is the safari at sunrise to see the blackbucks. Even Varun was thrilled to get up early to go out in the jeep and see deers in their natural habitat. We not only saw deers but a wild boar, countless peacocks and many langoors. 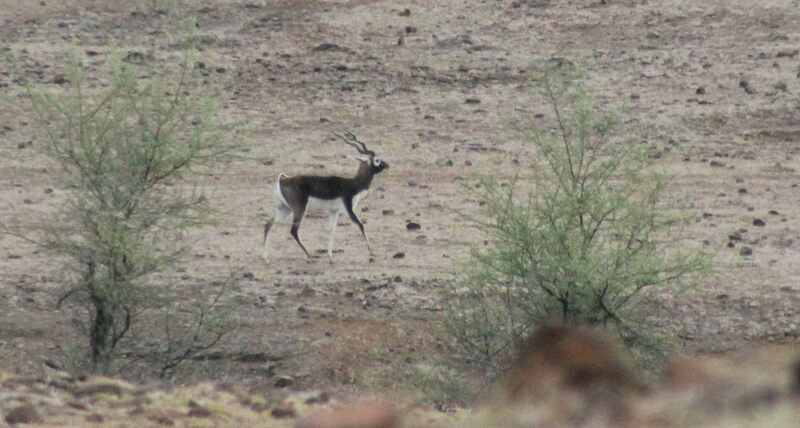 While we were driving back, a dog chased a herd of blackbucks around and it was surreal to see them galloping away. We also saw a whole bunch of colorful birds whose name I don’t recall anymore. We came back from the safari to breakfast and then sat on the private gallery off the cottage to watch more birds and animals come to the lake below. We saw lizards and a huge reptile cross across the brush below amongst other scary animals like tadpoles, frogs and squirrels. We left after taking a short nap as we were tired after carrying Varun on the long nature walk and waking up early to for the Safari. Our initial plan was to leave after lunch and shop for the Bidri artwork that Bidar is so famous for. But the mid day heat got to us. It was back in 40’s again. Varun slept as soon as we started driving back. We plan to visit again after the monsoon season when the weather will be cooler, the lake full and the deers back in larger numbers. A White Temple Overlooking A Lake – Birla Mandir and Hussain Sagar Lake. 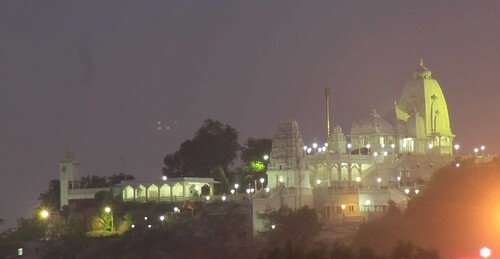 I can’t believe I have not posted about the two popular attractions of Hyderabad: Birla mandir and Hussain Sagar lake. Chances are you have seen the photos of a huge Buddha Statue rising above calm lake when you have searched for Hyderabad attractions. That lake is Hussain Sagar lake. Its an artificial lake built to solve the cities drinking water problem by Qtub Shah dynasty ( the ones now rest in Qtub Shah Tombs). Along the lake on one side are gardens and parks known as Tank bund. In the evenings, you will find young couples in love, families out for a stroll and friends making fun of each other and things around them all along the lake front. There are chaat-walas and ice-cream sellers. And a lot of traffic driving past noisily. Its quiet only after 10 pm or before 8 am; that’s when it makes for a pleasant walk ( if it isn’t smelly;))! There are boat rides offered to the tall Buddha monument from Lumbini Park – a small urban park with laser and light show and musical fountains. We have not taken the ferry though I know my cousin is known to take the last boat ride fairly often. She mentioned its not as crowded then and it beautiful to watch the lights of necklace road (stretch of road between NTR gardens and Sanjeevaiah park) twinkle at night. Birla Mandir is a beautiful white marble temple dedicated to Lord Balaji and is built on top of a hillock overlooking the Hussain sagar lake. Built by Birla foundation, it offers spectacular views of the lake, tank bund, various administrative buildings, flyovers and even Lumbini Park. It is a quiet place to contemplate life as the traffic goes by below.As with all Birla temples, security is tight, photography is restricted and even cellphones are not allowed inside. Almost everyone visiting us wants to see both these places. Luckily they are very close to each other. A late afternoon temple visit, followed by a drive around the lake is perfect prelude to dinner in Ohri’s Tansen or at the Eat Street. I have seen folks go post dinner once the traffic has died down and then enjoy ice-cream at one of the many carts that are around. 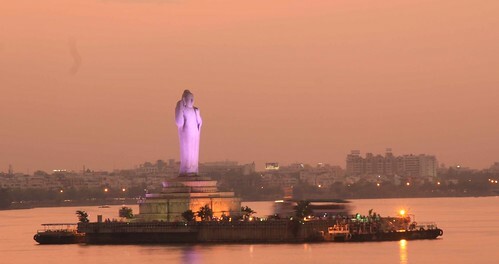 If you have no other plans, why not visit Hussain Sagar this weekend? 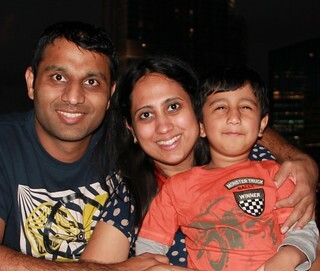 Its been more than a week since we are in Mumbai and strangely I am missing my home in Hyderabad. 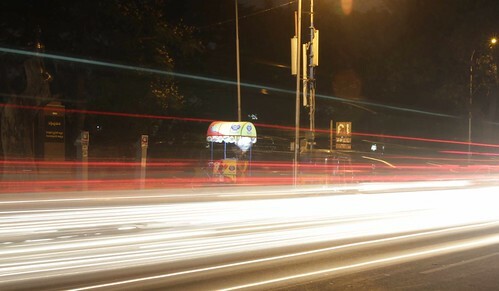 I never thought that I would miss Hyderabad over Mumbai, ever. Yet, here I am flicking though pictures of us together playing in the garden, in the tent and going through routine day-to-day tasks such as reading books at night. 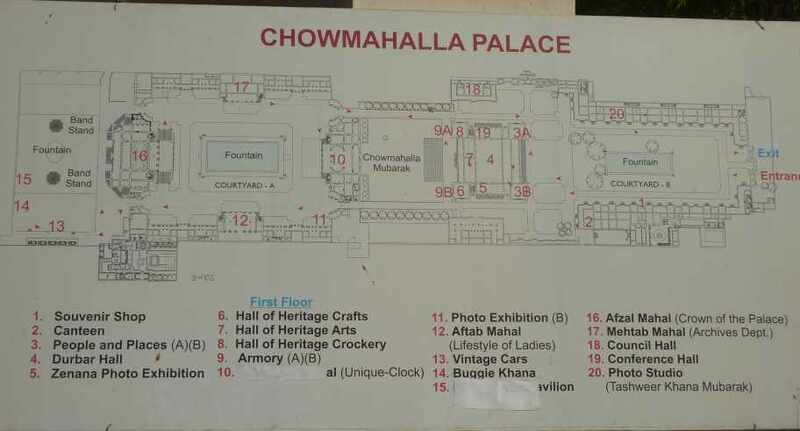 I came across these pictures of recent trip to Chowmahalla palace with my cousins and realized that I have not blogged about it. 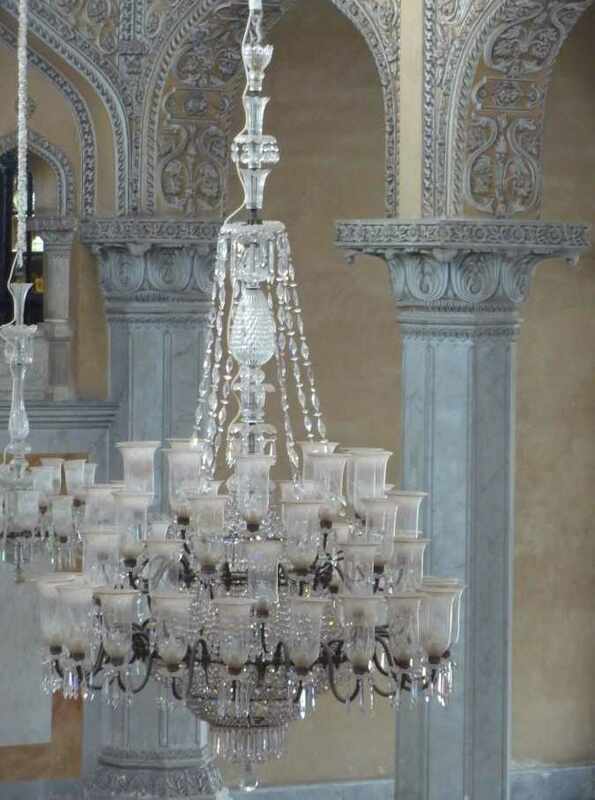 A complex of four Nizam palaces, central courtyards, surrounding corridors and gardens; it depicts the elegance of those days through carvings on the walls, rich tapestries and huge vintage chandeliers. 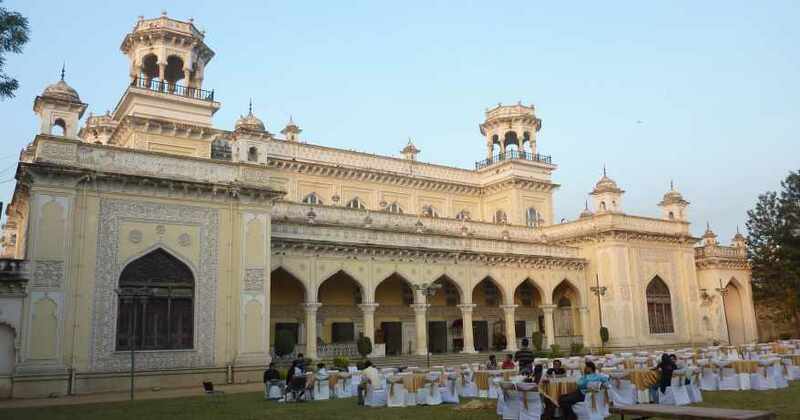 Very similar to Falaknuma Palace in general layout ( which is more ornate), Chowmahalla is an unexpected oasis of calm amidst the bustling Old Hyderabad. Open to public (unlike Falaknuma which you can only visit if you dine or stay at the Taj property), this is on my ‘don’t miss’ list for Hyderabad. The fountains in courtyard have a couple of ducks gently wading by. 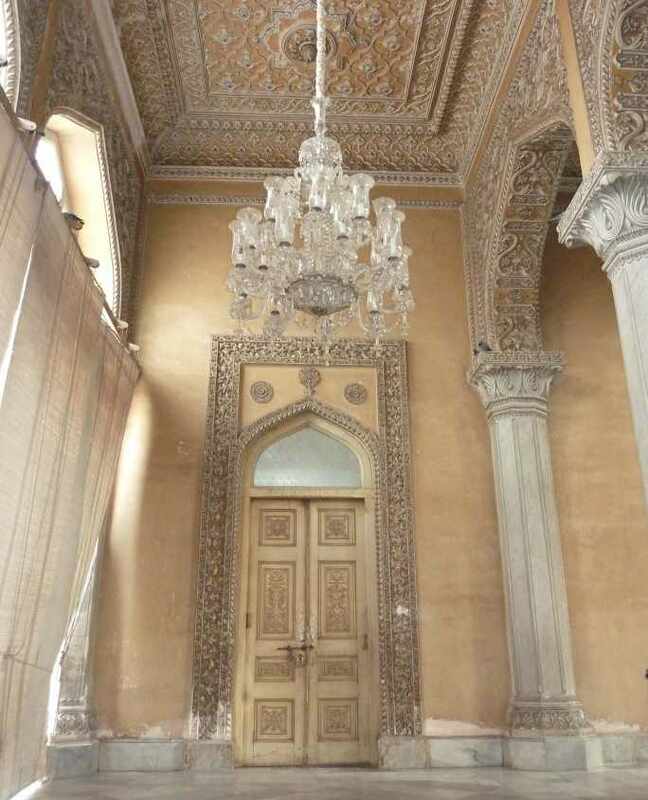 One of the mahal’s acts as museum of heritage clothes, furniture , arts and crockery. 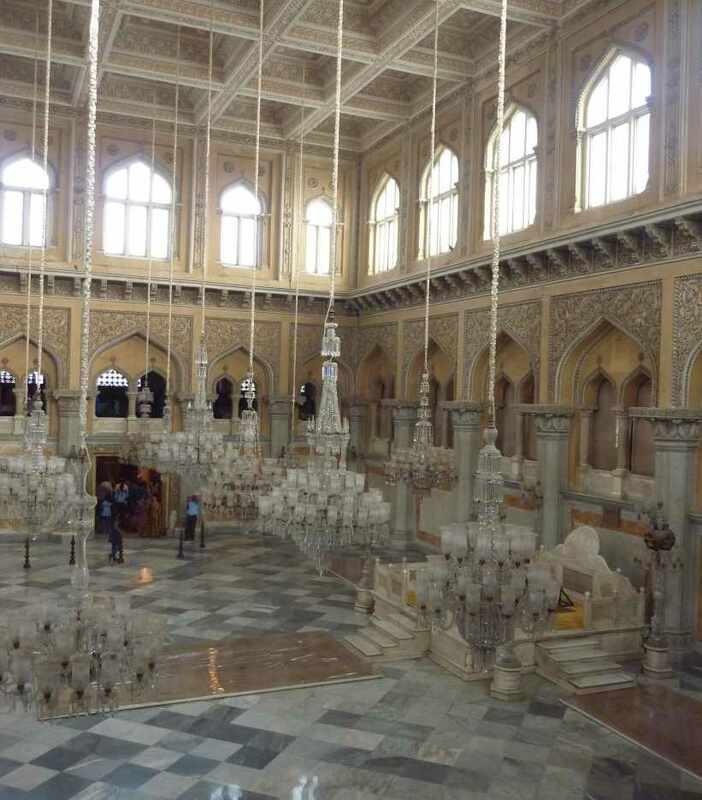 A stones throw from Charminar, it has vintage cars and buggies. 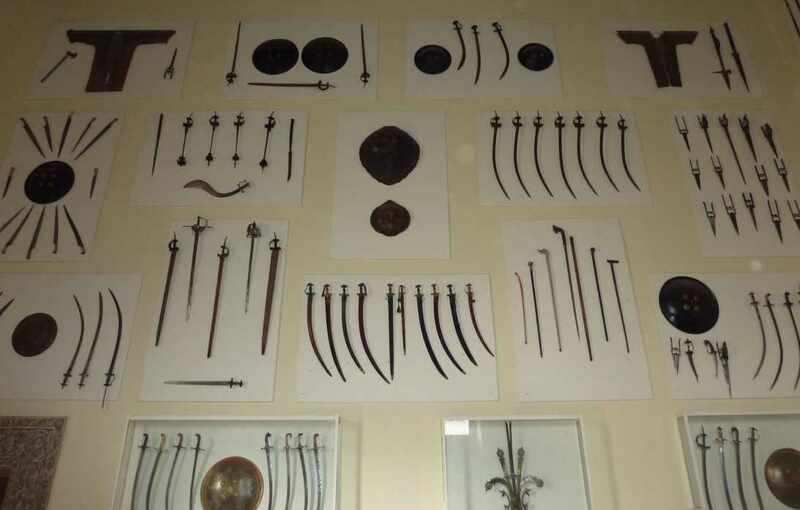 Swords, daggers, arrows , shields are displayed in a very modern classical manner. 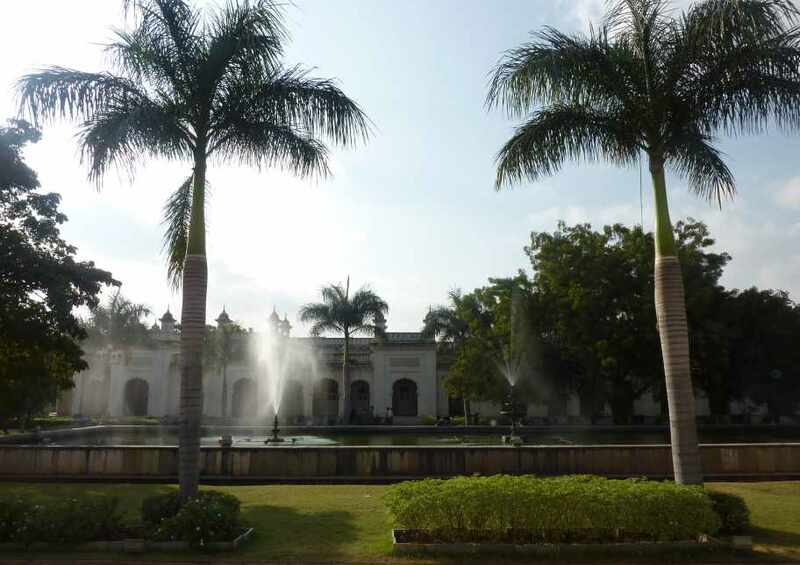 Trees with century old canopies and pigeons add to the old world charm of this palace. This place has something for everyone. Kids, art lovers, architecture buffs, lovers, romantics at heart, vintage car lovers, textile designers, landscape designers, photographers…I am sure you will be inspired and will love this place just as much as I did. It easily takes a couple of hours to wander through its corridors and wings. 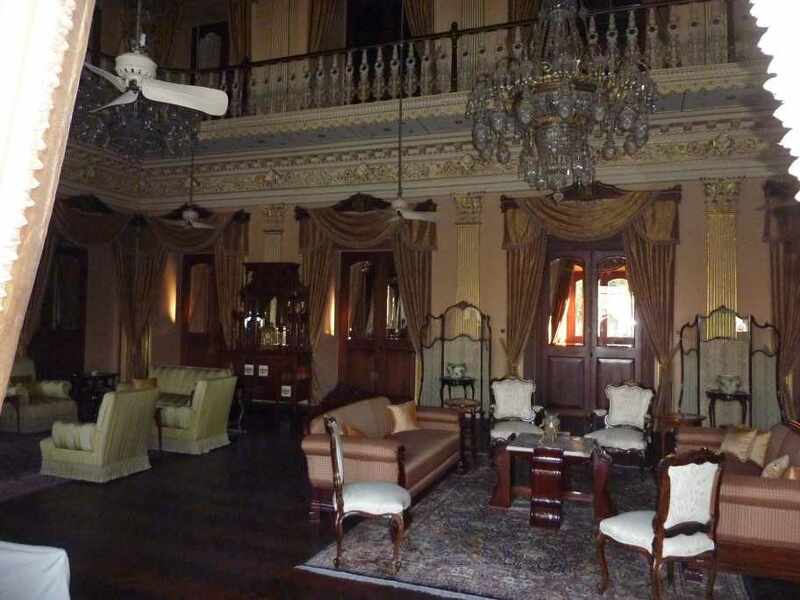 The furniture and crockery are reminiscent of Salar Jung museum. 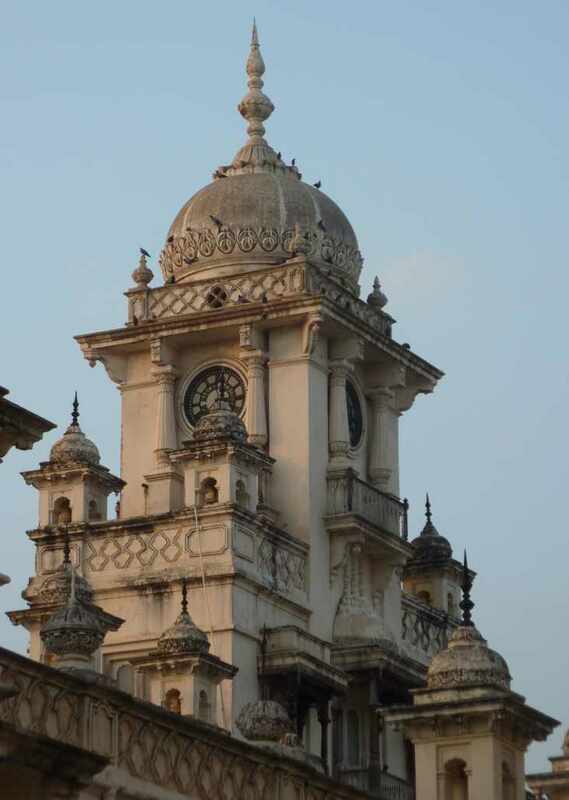 There is also a vintage clock which chimes every hour (similar to the cuckoo clock in Salar Jung). 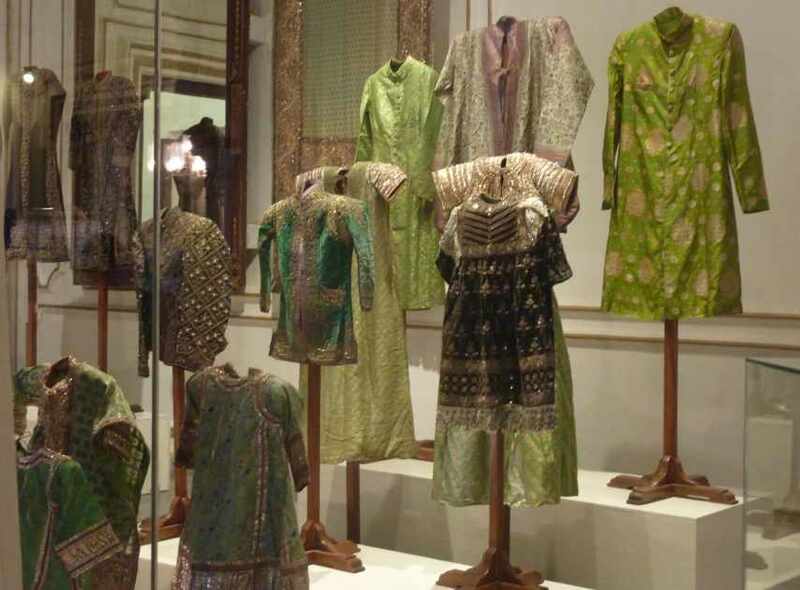 In fact if you are strapped for time or not into museums, skip Salar Jung museum and visit this palace to get a taste of arts and lifestyle in that era. 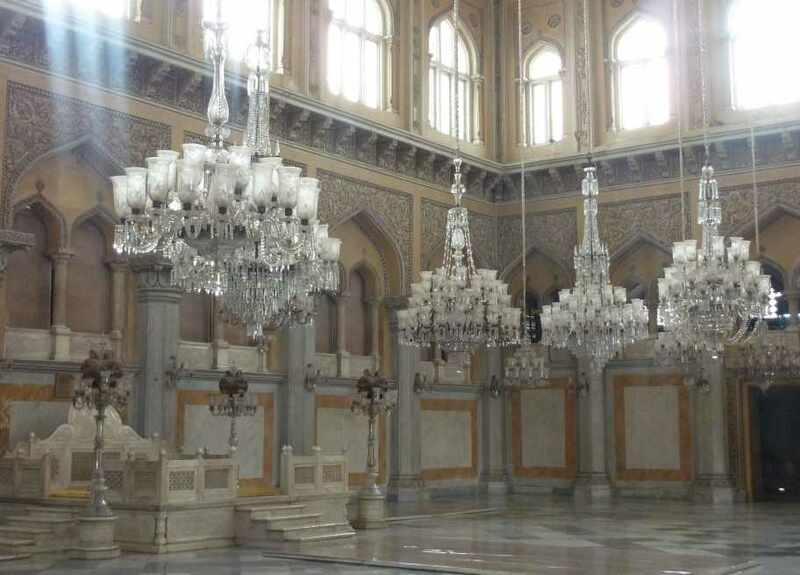 As you exit the royal durbar palace, you will find arrangements for some function or the other. The grounds are rented for ceremonies and corporate functions. Wouldn’t it be lovely to exchange vows or get engaged against this gorgeous backdrop? 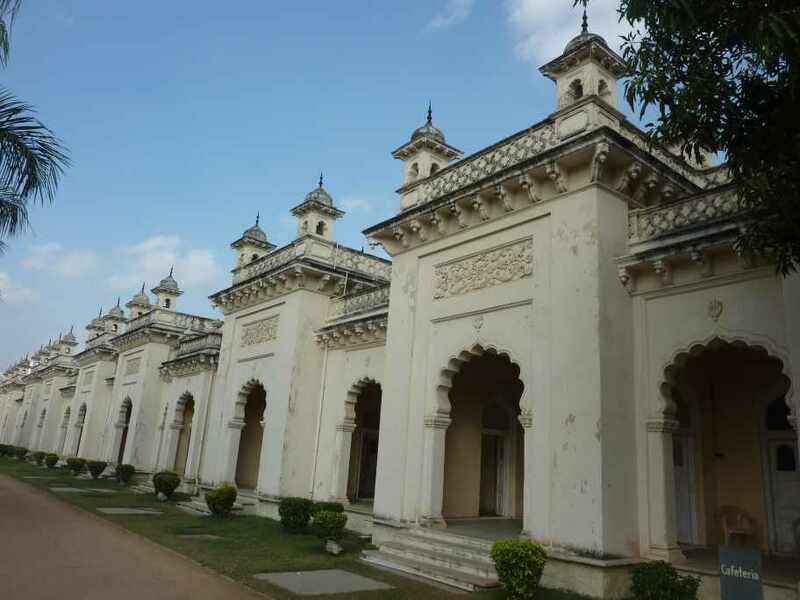 The lawns beyond lead to the vintage clothes, cars , buggies and the royal living room where the royal guests used to be entertained. Varun loved running around in the corridors and looking out through the large windows. He identified elephants, horses and tigers in the paintings and carvings. 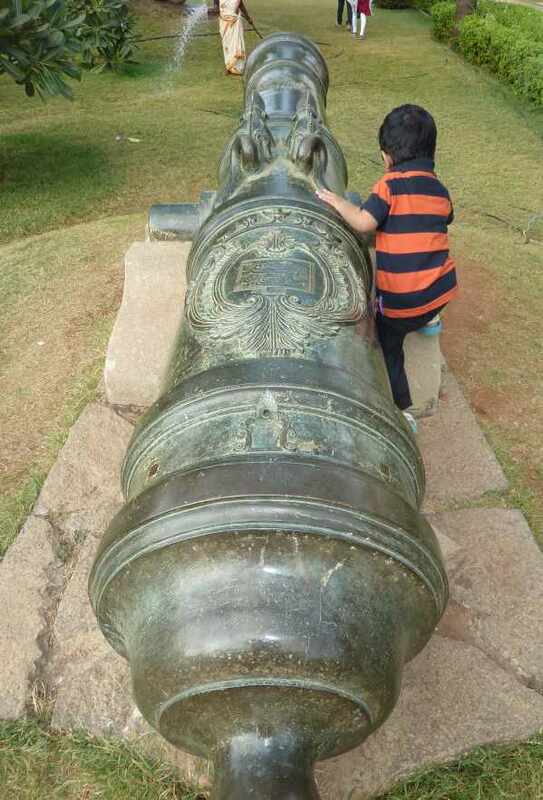 But he was most fascinated by the huge canons with carved dragons kept in the courtyard. 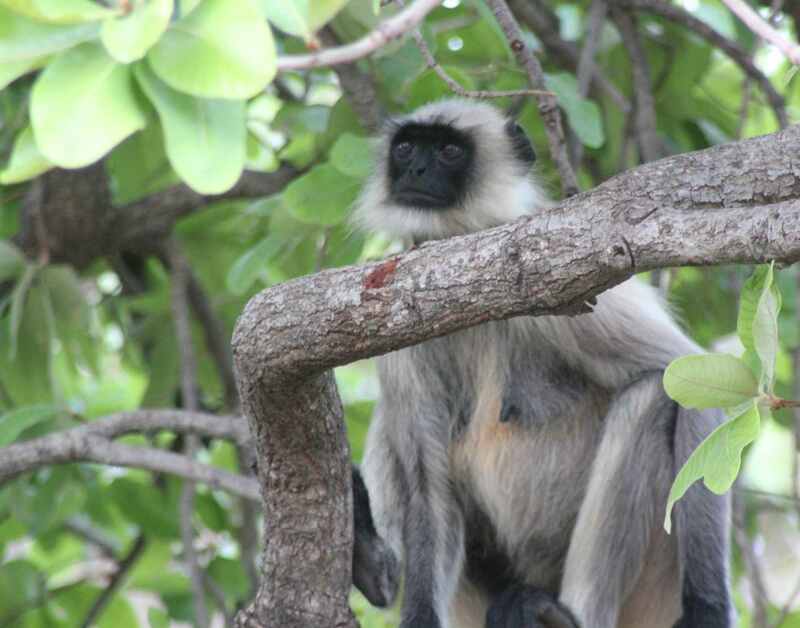 One of us was constantly chasing him – such is travelling with a toddler. Sunset and closing time loomed on us. Pigeons swarmed together in the fading sun light. 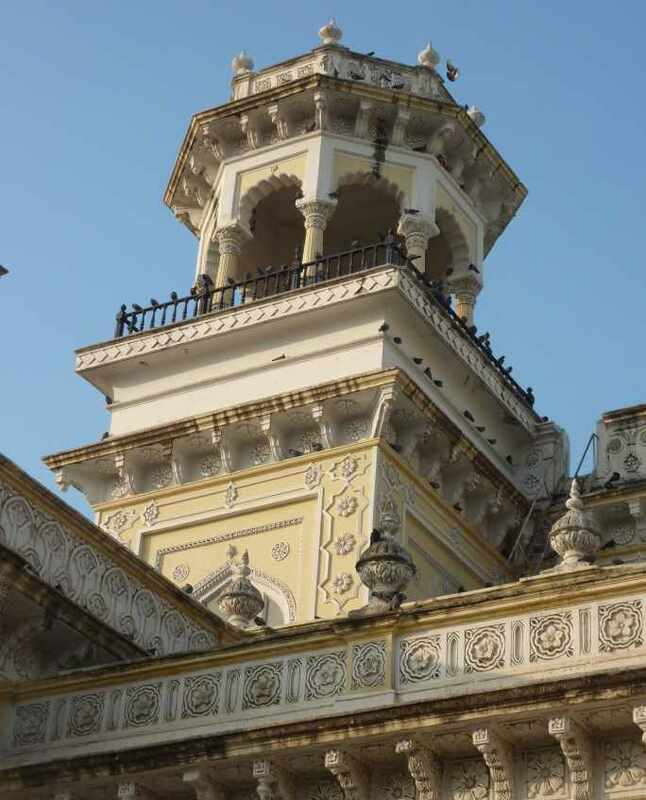 We walked by giant clock tower which is still maintained admiring the architecture, lemon and orange trees on the grounds; with a promise to come again – this time with more time to spare. Posted in Around Hyderabad, India. 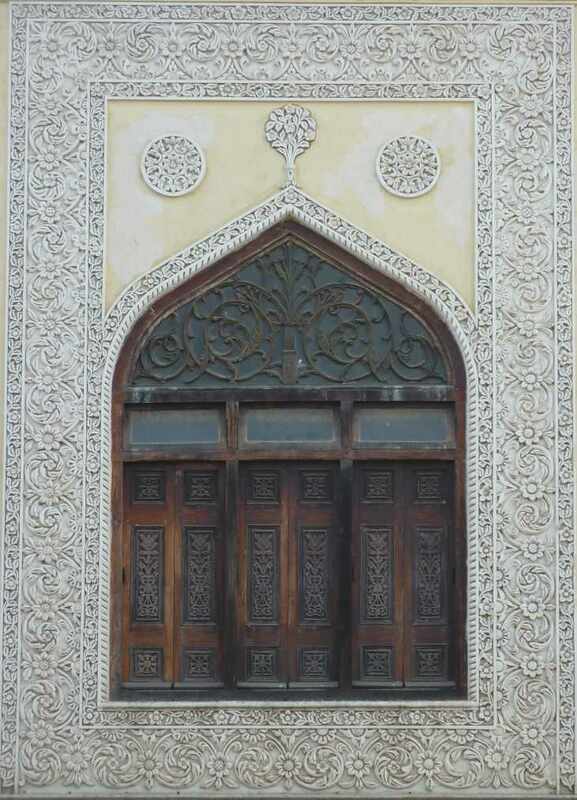 A friend recently asked me for sight-seeing options in and around Hyderabad. She was wondering of there is something that is sorted by driving distance. I didn’t know of one that exists as is so I shared my bucket list with her.This is not an exhaustive list, but list of places that I want to visit :)If you are visiting Hyderabad, you will find this handy in planning your trip.